Oro del Desierto olive oils are pressed from from carefully hand-picked olives, chosen for quality and freshness. The olives are pressed at low temperatures, within 4 hours of being picked. All this creates the world’s most prized 0.1% acidity organic olive oil. Our Gourmet Olive Oil Taster Combination Set is perfect wine and cheese parties, or every day gifts. Arbequina uses approximately 5 times the normal fruit to produce a mild, delicately sweet flavour. Picual Olive Oil tastes so heavenly, it won the 2015/2016 Best Olive Oil award from the Olive Japan Contest. Coupage Olive Oil is created from an artisanal blending of organic olives to create an olive oil that ranks as one of the World's Best Olive Oils in 2014/2015. Grown in the arrid soil of the Andalusian desert, this low acidity organic olive oil is one of the purest to be found. 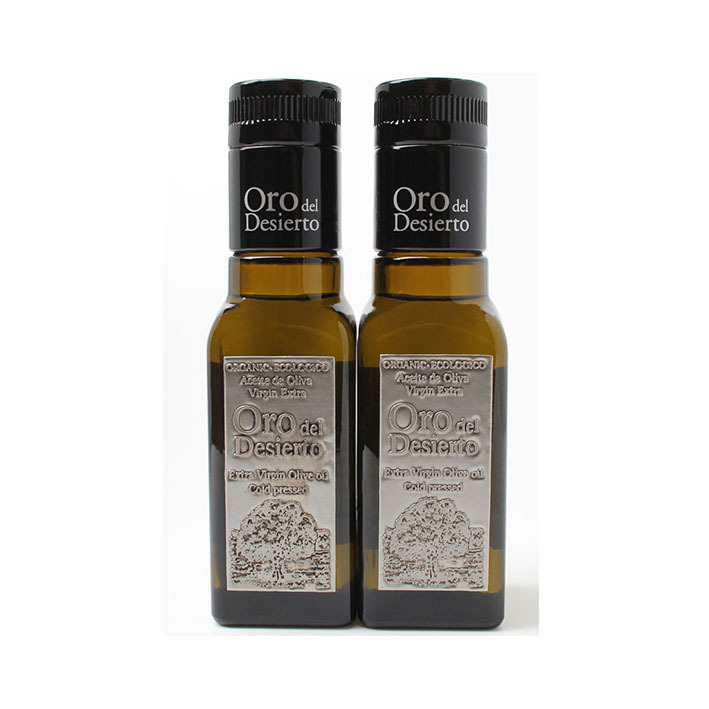 Oro del Desierto olive oils are pressed from from carefully hand-picked olives, chosen for quality and freshness. The olives are pressed at low temperatures, within 4 hours of being picked. All this creates the world’s most prized 0.1% acidity organic olive oil. We deliver our olive oil to you directly from Spain. Arbequina Pressed from 100% organic Arbequina olives, this oil is a light fruity oil with a light golden-yellow color. It’s known for its complex vegetal aroma with hints of ripe tropical fruits, banana, parsley and basil. Its taste is fine and strong with flavors of celery, lettuce and pine nut. Pairs with: Delicate white fish, white meat, and leafy greens. Picual: Pressed from 100% organic Picual olives, this oil is a medium-intense fruity oil and golden-green in color. Its aroma is strong and well-rounded with fruity notes of ripe tomato and banana enriched with spicy hints of black pepper, mint and oregano. Its taste is robust with harmonious vegetal notes and a definite almond finish. Pairs with: Bitter greens, roasted/grilled vegetables, red meat, cheese, soups. Coupage: An award-winning, specially-crafted blend of Organic Arbequina, Hojiblanca and Picual olives picked between the end of October and beginning of November. The oils are then stored in 2,000 liter deposits where they are analyzed, then selected in varying quantities, and finally blended by the Master Taster to create a superb olive oil with a limited production. The result is a leafy green and golden oil with a bouquet of freshly cut grass, tomato, green olive with hints of citrus and dried fruits. Its taste is well-balanced and medium to smooth in intensity with a pleasant, slightly spicy aftertaste. Pairs with: Dipping, salads, vegetables, meats & fish. Oro del Desierto olive oils are pressed from from carefully hand-picked olives, chosen for quality and freshness. The olives are pressed at low temperatures, within 4 hours of being picked. All this creates the world’s most prized 0.1% acidity organic olive oil. Oro del Desierto olive oils are pressed from from carefully hand-picked olives, chosen for quality and freshness. The olives are pressed at low temperatures, within 4 hours of being picked. All this creates the world’s most prized 0.1% acidity organic olive oil. Our 100ml bottles make a perfect gift for dinner party hosts or for tasting. Coupage Olive Oil is created from an artisanal blending of organic olives to create an olive oil that ranks as one of the World’s Best Olive Oils in 2014/2015. Coupage Olive Oil is created from an artisanal blending of organic olives to create an olive oil that ranks as one of the World's Best Olive Oils in 2014/2015. Coupage Olive Oil received first prize from Olive Japan 3 years in a row, 2015, 2016, 2017. Production: Cold extraction 2 phases. Only with early harvested olives, 95% still green. First week of harvest in October. Number of bottles: 8000 units. Only 200 units are annually allocated to the Japanese market. Formats: 500ml customized bottle, individual box packaging for every bottle to protect it from light. Zone of production: Finca el Vicario, Desierto de Tabernas (Almería) Spain. Flavour / Taste: Dark green cloudy colour, typical from the unfiltered fresh olive oil**. Its aroma is exceptionally intense and fresh with notes of green grass, tomato, apple and almond. Astringent flavour with bitter and spicy touches which will be less intense as the oil changes and decants during the first weeks. Good balance between aroma and flavour, the 2 varieties combined for this blend make a perfect combination. Recommendations for use: Pair this oil with fresh goat cheese, green salads, sauces, tomato and garlic salads, toast or just simply put it on a dish and dip it with bread. * Only 20 bottles are sold online in this season. ** The 2018 Edition of the 1/10 product is filtered.